A recently introduced Senate bill threatens to further legitimize Helping Hands, an outdated and inhumane primate “training facility” located in Boston, when it should be shut down permanently. Created in 1979, Helping Hands: “Monkey Helpers for the Disabled” has spent the last 30 years attempting to convince the public that high-energy, curious, extremely intelligent primates are an acceptable service pet for people with paralyzing disabilities, despite the fact that their needs could just as effectively and easily be met by the use of robotic equipment. "Monkeys are not domesticated animals," said April D. Truitt, founder and executive director of the Primate Rescue Center, based in Nicholasville, Kentucky. "They cannot be made so in one generation or 20." After facing extreme levels of scrutiny and criticism from concerned individuals and groups like Friends of Animals and Primarily Primates during the late 80’s and early 90’s, Helping Hands now goes to great lengths to keep its cruel training methods and internal workings hidden from the public. Disturbing and painful training methods were also disclosed...with previous employees of Helping Hands testifying that electric shock packs were attached around the monkey’s waist during training and “delivered the equivalent of the charge felt in a typical electric cattle fence” to the monkey whenever it performed an action deemed undesirable by trainers. Painful and deforming full-mouth dental extractions were also performed on the capuchin monkeys after incidents occurred involving monkeys biting their owners and trainers. Today, Helping Hands has made it very difficult for any member of the public to glimpse the training methods they are currently practicing. 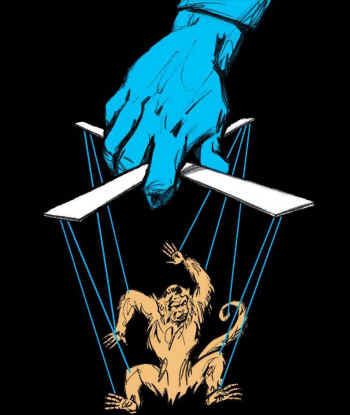 After obtaining one of the most recent training guides Helping Hands distributes to “foster parents” and owners of the monkeys, it is obvious the organization intends to distance itself from barbaric training exercises. Now, the guide insists that “love and the comfort of the monkey” are what guides training practices and now “praise, rewards, and timeouts” are the primary tools used in rendering these primates suitable for assistive purposes. Despite whatever politically correct language Helping Hands has started adopting in regards to its training methods, the cruelty of the program is still very much apparent if you are to attend one of their “show and tell” workshops at convention centers and watch as a trainer leads around a capuchin on a leash and dressed in a diaper or read testimonies by foster parents and owners of the monkeys on web forums. Another starts with a question asking, "Does anyone have any advice on his ingrained habit of picking at a sore on his body 'til its bloody?” The issues are seemingly endless with questions ranging from what to do if the capuchin is terrified of human contact to how to give away your capuchin if you can no longer afford to keep it. And it is no surprise that capuchin owners turn to the Internet and each other when care questions arise. In 2010, Helping Hands also found itself in the middle of lawsuit after one of the “foster parents” the organization uses to house monkeys in between owners, refused to surrender a monkey named Gabby back to the program, claiming she had adopted the capuchin. Helping Hands insisted that the monkey needed to be returned to the organization because it was not being properly trained and cared for, however the foster parent argued that Helping Hands did not provide a foster care manual or training as it claims, and did not respond to her questions about caring for the monkey for more than nine months. It is also almost unbelievable the organization may be on the verge of being granted special privileges from a new primate safety law. Senate Bill S.1463, the Captive Primate Safety Act, was introduced in the House in 2013 and at first glance, the bill seems like a step forward in the plight of captive primates...but a closer look at the details reveals this is most certainly not the case. The bill, which makes it unlawful for a person to import, export, transport, sell, receive, acquire, or purchase primates in interstate or foreign commerce, includes two exclusions. One is for a “licensed and inspected person who does not allow direct contact between the public and prohibited wildlife species”. The other exemption is described as, “transporting a single primate of the genus Cebus that was obtained from and trained by a charitable organization to assist a permanently disabled individual with a severe mobility impairment.” Unsurprisingly, there are very few organizations that fall into this category and are able to reap the benefits of being effectively considered “above the law,” but Helping Hands has found itself in this position. As mentioned previously, this organization needs to be exempted or face the downfall of its operation because it is currently not USDA licensed. This is despite the fact that its breeding colony is maintained at Southwick Zoo in Boston. If Helping Hands was licensed, it would not require the specific exemptions written into this bill, since USDA licensees are exempt. As if legitimizing Helping Hands is not bad enough, the passage of this federal measure would also be a step backward as it would outstrip stronger laws in other states that prevent privatization of nonhuman apes, monkeys and prosimians, like Connecticut. After only scratching the surface of the problems and pain Helping Hands is causing, it is clear that the only legislation that should be passed is one that closes the doors on this cruel and inhumane program for good.